Dec. 13, 2012: A pair of NASA spacecraft that have been studying the Moon's gravitational field are being prepared for a controlled descent into a mountain near the Moon's north pole. Impact is expected at about 2:28 p.m. PST (5:28 p.m. EST) on Monday, Dec. 17. "It is going to be difficult to say goodbye to our little robotic twins," says MIT professor Maria Zuber, principal investigator of the Gravity Recovery and Interior Laboratory (GRAIL) mission. "Planetary science has advanced in a major way because of their contributions." The two probes, named Ebb and Flow, are being sent purposely into the lunar surface because their low orbit and low fuel levels preclude further scientific operations. Ebb and Flow's successful mission to the Moon has yielded the highest-resolution gravity field map of any celestial body. The map will provide a better understanding not only of the Moon, but also of how Earth and other rocky planets in the solar system formed and evolved. 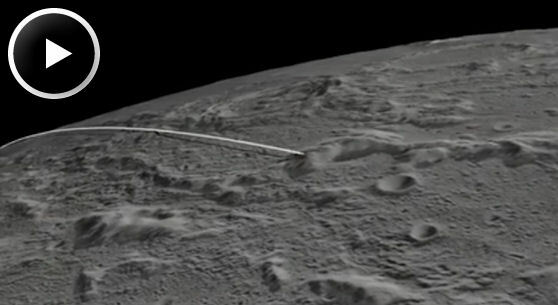 The spacecraft have been flying in formation around the Moon since Jan. 1, 2012. They were named by elementary school students in Bozeman, Mont., who won a contest. The first probe to reach the Moon, Ebb, also will be the first to go down, at 2:28:40 p.m. PST. Flow will follow Ebb about 20 seconds later. Both spacecraft will hit the surface at 3,760 mph (1.7 kilometers per second). No imagery of the impact is expected because the region will be in shadow at the time. The impact site is located near a crater named Goldschmidt. Ebb and Flow will conduct one final experiment before their mission ends. They will fire their main engines until their propellant tanks are empty to determine precisely the amount of fuel remaining in their tanks. This will help NASA engineers validate fuel consumption computer models to improve predictions of fuel needs for future missions. "Our lunar twins may be in the twilight of their operational lives, but one thing is for sure, they are going down swinging," said GRAIL project manager David Lehman of NASA's Jet Propulsion Laboratory in Pasadena, Calif. "Even during the last half of their last orbit, we are going to do an engineering experiment that could help future missions operate more efficiently." Because the exact amount of fuel remaining aboard each spacecraft is unknown, mission navigators and engineers designed the depletion burn to allow the probes to descend gradually for several hours and skim the surface of the moon until the elevated terrain of the target mountain gets in their way. The burn that will change the spacecrafts' orbit is scheduled to take place Friday morning, Dec. 14. "Such a unique end-of-mission scenario requires extensive and detailed mission planning and navigation," said Lehman. "We've had our share of challenges during this mission and always come through in flying colors, but nobody I know around here has ever flown into a Moon mountain before. It'll be a first for us, that's for sure." 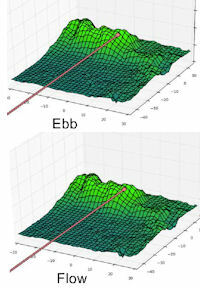 During their prime mission, from March through May 2012, Ebb and Flow collected data while orbiting at an average altitude of 34 miles (55 kilometers). Their altitude was lowered to 14 miles (23 kilometers) for their extended mission, which began Aug. 30 and sometimes placed them within a few miles of the moon's tallest surface features. JPL manages the GRAIL mission for NASA's Science Mission Directorate in Washington. The mission is part of the Discovery Program managed at NASA's Marshall Space Flight Center in Huntsville, Ala. Lockheed Martin Space Systems in Denver built the spacecraft. JPL is a division of the California Institute of Technology in Pasadena. For more information about GRAIL, visit: http://www.nasa.gov/grail .